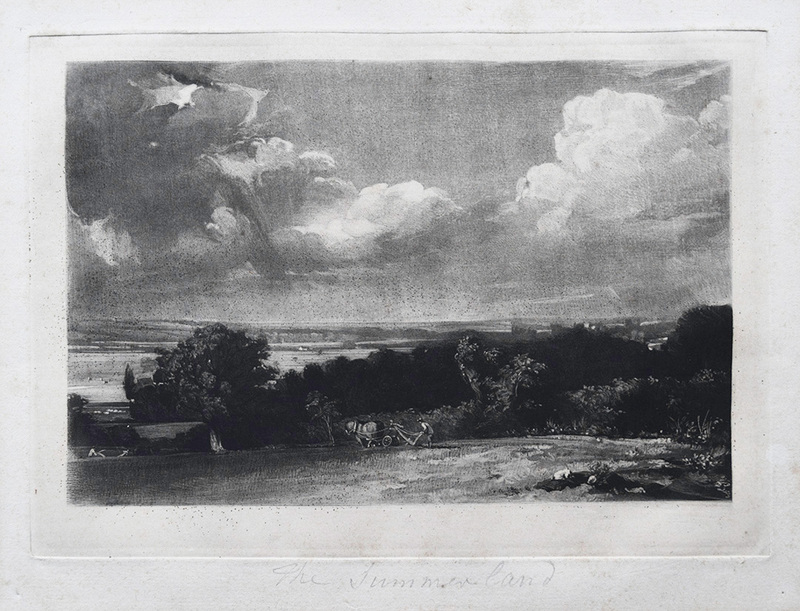 This is the fifth in a series of articles in which I discuss a recently-discovered progress proof of the mezzotint of ‘A Summerland’ made by David Lucas for John Constable in 1829. Here I begin consideration of the landscape, not far from Constable’s birthplace in the Suffolk village of East Bergholt, together with Constable’s two paintings of the subject, culminating in the engraving of ‘A Summerland’. 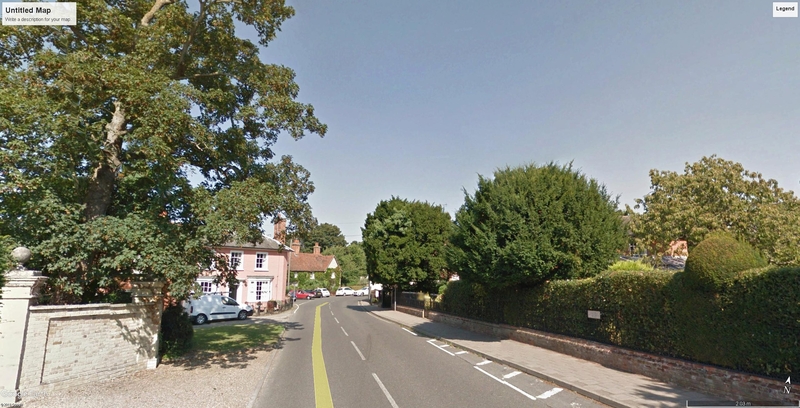 I had intended this week to make a trip to East Bergholt to revisit the site. I was last there in 1984 when writing ‘John Constable’s English Landscape Scenery’ published in 1985. Frustratingly, the light levels for the next couple of weeks are forecast to range from gloomy to grim. For now, then, Google Earth will have to suffice. But first, some brief background. 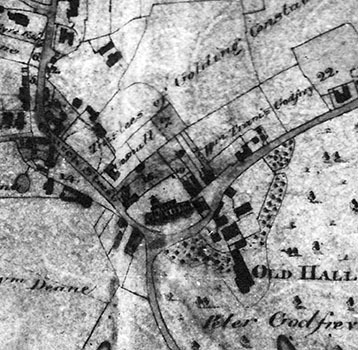 John Constable was born in 1776 in a fine Georgian house near the church. The house is long gone, but a plaque is fixed to its railings to mark the spot. His father was a wealthy merchant and miller, with trading interests in almost the entire economy of the valley. John Constable was supposed to have a proper career in the church or in the business, but instead elected to become an artist. He went off to London to seek his fortune, but adopted the plan of painting scenes of his hopelessly obscure native landscape. The pictures are of course wonderful, but their beauties were lost on the public until after his death. He remained throughout dependent on the family business, latterly managed by his brother. The view depicted in ‘The Summerland’ is that looking west up the Stour valley from Flatford Lane which leads from East Bergholt Church to Flatford Mill. The exact viewpoint can be found looking right a couple of hundred yards beyond the junction with Fen Lane. The lie of the land and general forms of field, hedgerow and distant view are all remarkably recognisable to this day. In the distance left is the tower of Langham Church, on the skyline right that of Stoke by Nayland, and just below that to the right is Stratford St Mary Church. I have not yet been able to verify whether all or any of these can still be made out. That is one reason for my wanting to visit at this time of year, so that the trees will now be bare. Constable made a pencil sketch of this view in 1813 in a sketchbook now at the V&A (317-1888; Reynolds 1996, no.13.17, p.12. The sketch is inscribed ’25 July – noon – / Suffolk’. 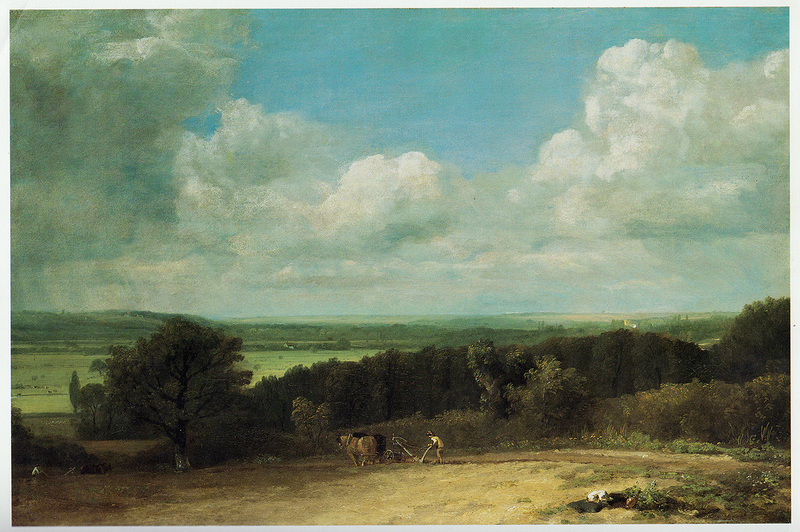 That sketch served as the basis of a painting exhibited at the Royal Academy in 1814 (28) as ‘Landscape: Ploughing Scene in Suffolk’. This is now in a private collection (Reynolds, 1996, 14.1). 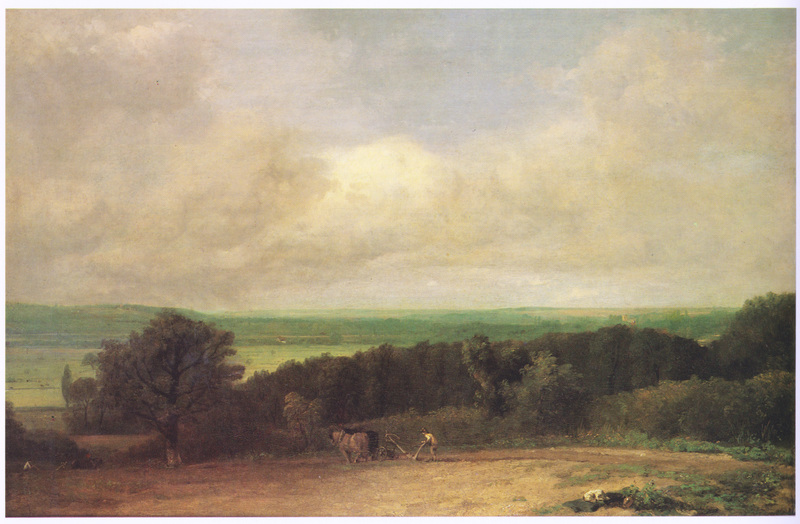 He reshowed it at the Liverpool Academy in 1814, no.9 as ‘A Landscape – Ploughman’, and then the following year at the British Institution in London, no.115 as ‘Landscape’ where it was bought by John Allnutt. Thereafter the story of the painting becomes rather peculiar. Allnutt became dissatisfied with the sky and had a new one painted over it by John Linnell. This seems to demand much greater explanation, but around 1825 he asked Constable to return the painting to its original condition and reduce the height so that it would match with a painting he had subsequently acquired by A W Callcott. Constable seems to have taken all this with remarkable equanimity – one can only conjecture what Turner’s response might have been to such treatment– and painted an entirely new version, which is now at the Yale Center for British Art at New Haven (B1977.14.41; Reynolds 1984, no.24.81). Constable might well exacted some compensation, however, for it is certainly worth considering whether the quality of the replacement is anything like that of the original. Inscribed in plate, lower right, ‘1829 D Lucas’, and inscribed in lower margin in graphite, ‘The Summerland’. Constable retained the original painting, though in quite what state is unclear. In any case it was that painting that Constable put before David Lucas as the basis of the mezzotint. Not long before the Tate Constable exhibition of 1991 the sky was restored by John Bull. 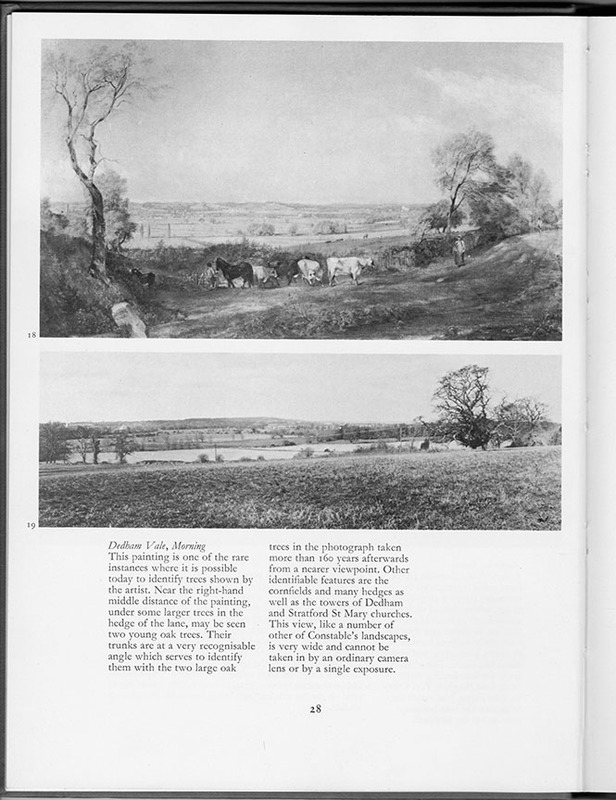 Its pre-restoration condition is recorded in colour reproductions in D Hill, ‘Constable’s English Landscape Scenery’, 1984, pl.15, and by Michael Rosenthal in ‘Constable and his Landscape’, 1987, ill 63. An account of the restoration is given in the catalogue of the Tate exhibition of 1991, where the painting was exhibit no.71. 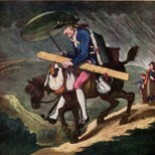 It is interesting to compare the restoration with the mezzotints. Certainly the sky as it now appears is closer to the earlier states up to state (c), rather than to the later states which are full of crepuscular rays and curtains of rain. 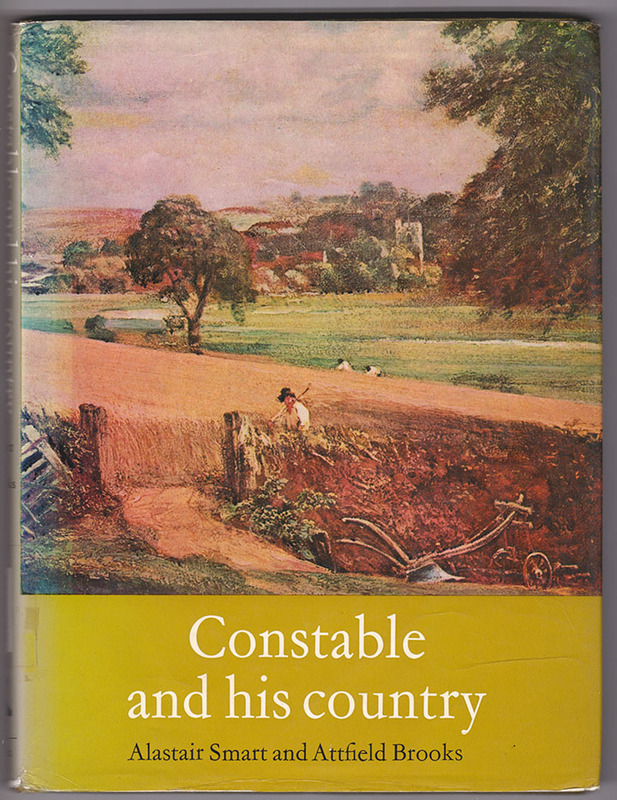 Constable treated the same locality remarkably frequently. It seem that on almost every visit to East Bergolt he sketched it, whether in pencil, watercolour or oils, and there are several finished paintings. Its popularity with him can be easily explained: It is simply the nearest and most open prospect of the Stour valley to his home in the village. 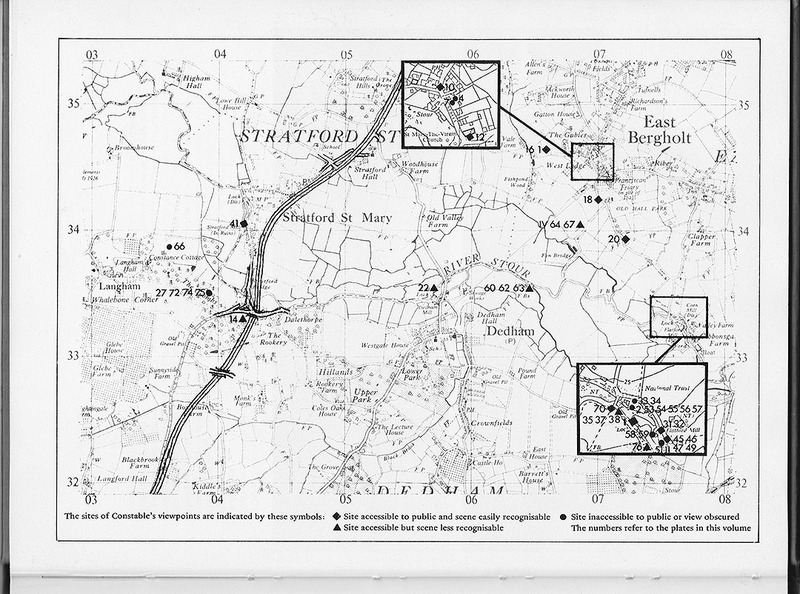 Alastair Smart and Attfield Brooks in their great book, ‘Constable and his Country’ published in 1976 for the bicentenary of Constable’s birth, give a map (p.30) marking numerous viewpoints of Constable subjects in the East Bergholt area. The viewpoint of Constable’s Dedham Vale: Morning, with comparative photograph. The very same tree! How good is that?! Constable’s geographic consciousness invites us to plot on today’s ground the exact vantage points of sketches and paintings. Along Flatford Lane, the general character of the landscape today is remarkably like that of Constable’s time. The fall of the slope for example, from viewpoints on below Fen Bridge Lane is exactly like that shown in the Summerland. 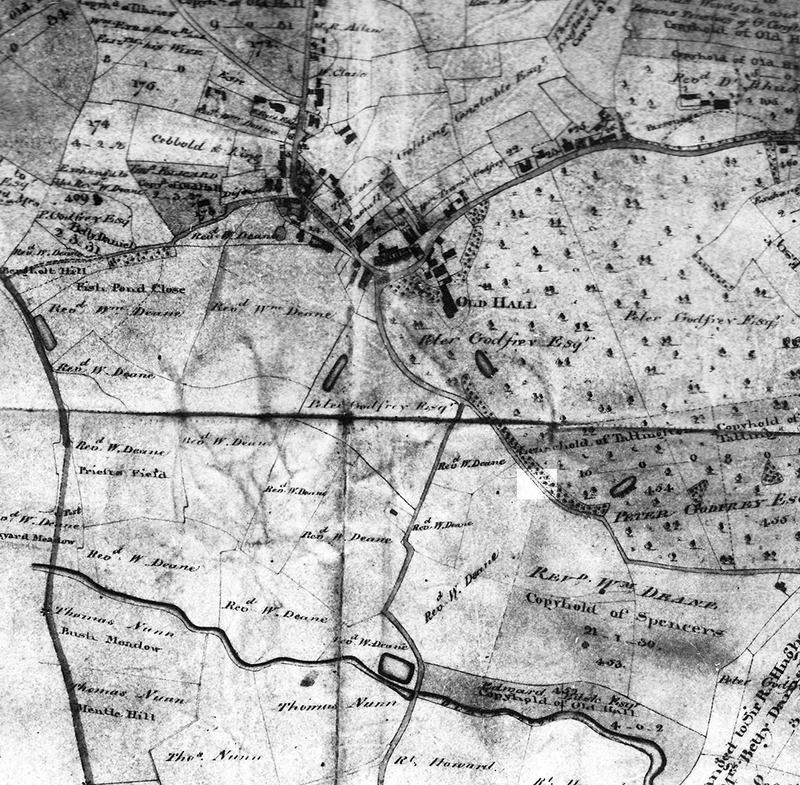 We are fortunate that there is a very detailed map of parish of East Bergholt drawn up in 1817. 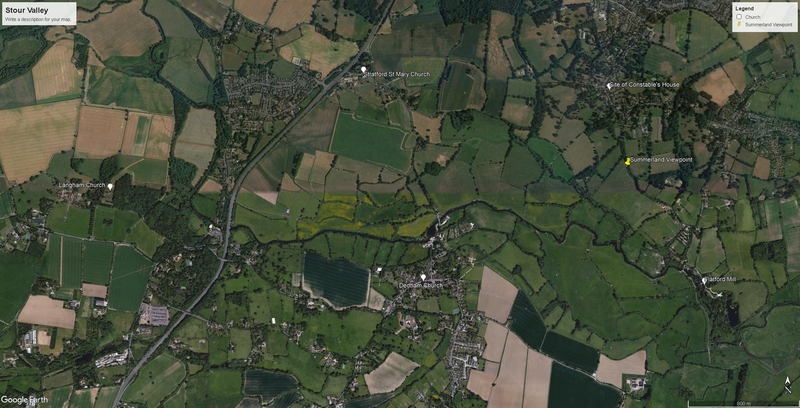 This shows every building, road, path steam, pond and field boundary and makes it clear that the present field boundaries are somewhat changed. 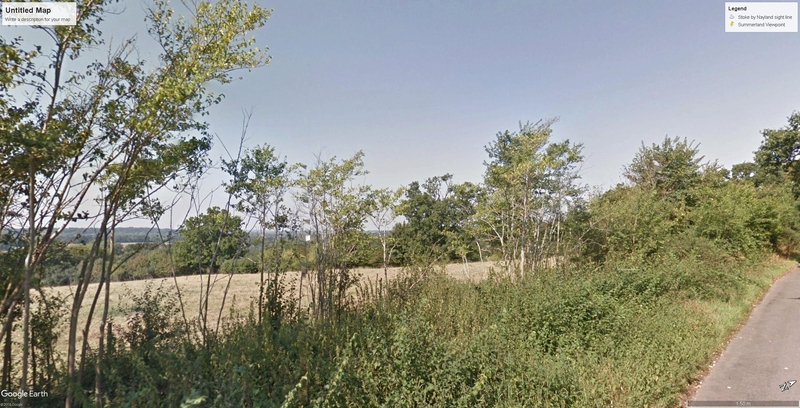 That is especially true in the area around the specific viewpoint of The Summerland, and I will have to take some care in plotting Constable’s exact position on the ground. Still, I’m pretty sure that I have all that I require to be certain, and with a bit of luck, and some brighter winter light, in the next I will report on what I discover. 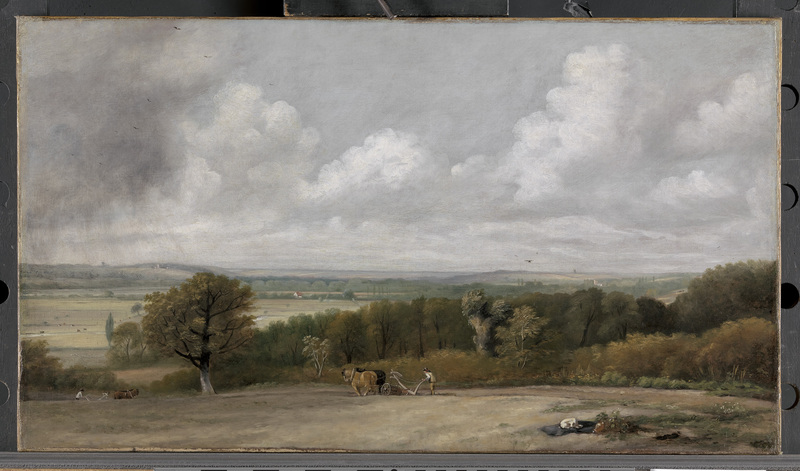 This entry was posted on November 22, 2018 by Professor David Hill in Constable and tagged Constable, East Bergholt, John Constable, Stour Valley, Suffolk, V&A, Yale Center for British Art.